Explanation: What is so super about tomorrow's supermoon? Tomorrow, a full moon will occur that appears slightly larger and brighter than usual. The reason is that the Moon's fully illuminated phase occurs within a short time from perigee - when the Moon is its closest to the Earth in its elliptical orbit. Although the precise conditions that define a supermoon vary, tomorrow's supermoon will undoubtedly qualify because it will be the closest, largest, and brightest full moon in over 65 years. One reason supermoons are popular is because they are so easy to see -- just go outside at sunset and watch an impressive full moon rise! Since perigee actually occurs tomorrow morning, tonight's full moon, visible starting at sunset, should also be impressive. 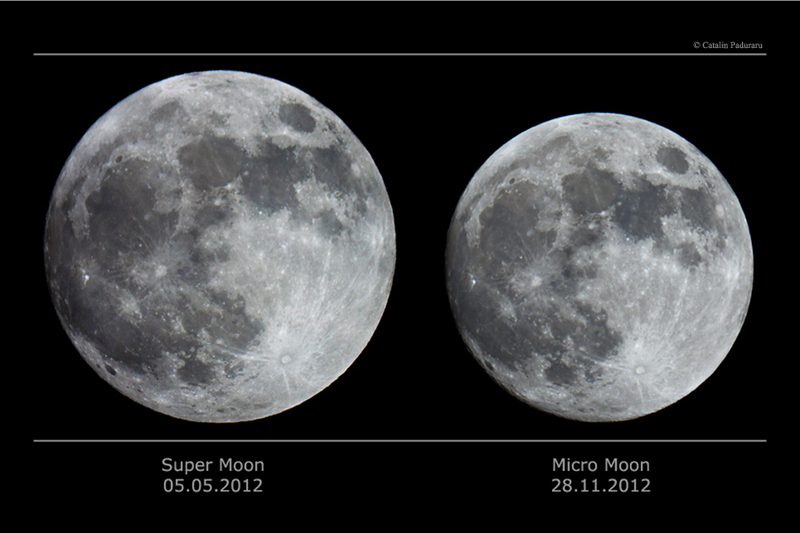 Pictured here, a supermoon from 2012 is compared to a micromoon -- when a full Moon occurs near the furthest part of the Moon's orbit -- so that it appears smaller and dimmer than usual. Given many definitions, at least one supermoon occurs each year, with another one coming next month (moon-th). However, a full moon will not come this close to Earth again until 2034.